Perhaps the most interesting thing about the Elijah Message is that it did not die with John the Baptist. sinners, and the immediate advent of Christ. but that the world through Him might be saved." (John 3:17). preach, and to say, Repent: for the kingdom of heaven is at hand." (Matt. 4:12,17). saved; but He that believeth not shall be damned." (Mark 16:16). with the Holy Ghost not many days hence." (Acts 1:4,5). Mine, and shall shew it unto you." John 14:26; 15:26; 16:7,13,14). servant, which I commanded unto him in Horeb for all Israel, with the statutes and judgments." (Mal. 4:4). offering for the dead to His Father in heaven. (See Matt. 27:52,53; John 20:17). Finally, completely fulfilling the New Testament Elijah Message, Christ spoke against marriage breaking. interferes with the love between fathers and children. harmonized by defining adultery as the breaking of the covenant of marriage. fail, according to the word of the Lord, which He spake by Elijah." (1 Kings 17:10-16). unclean people, tax collectors and sinners. flesh in the evening; and he drank of the brook." (1 Kings 17:5,6). See, thy son liveth." (1 Kings 17:17-23). Himself to be a New Testament Elijah. between fathers and children is still common. ministry, we should expect the end time Elijah messengers to also be intimately associated with Christ. that thou hast a name that thou livest, and art dead." (Rev. 3:1). ever and ever." (Dan. 3:12). and their righteousness is of Me, saith the Lord." (Is. 54:17). denominations. All will be walking in God's Law, just as Christ taught. earth pass, one jot or one tittle shall in no wise pass from the law, till all be fulfilled." (Matt. 5:18). forth into all the earth." (Rev. 5:6). earth" by Christ, whose ministries must completely fulfill the Elijah message. prophets (see 2 Kings 1:9-12). 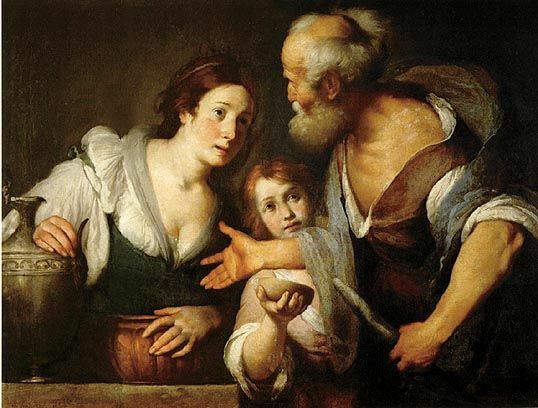 Elijah the Tishbite, the widow of Zarephath and the child that Elijah resurrected.